Vinyl floor removal is more about patience and studious labor than specialized skills. It’s not necessarily complicated but it is time-consuming and requires a lot of hard work to get it done and the right results without causing unintentional damage. It’s easy to cause damage to the subfloor when removing vinyl, usually due to the glue and tools used to pull it up. Not to mention the fact that you’ll need to rent a few tools you might not be familiar with using. If you’re gutting a bathroom, removing vinyl is typically a good option to complement the update. 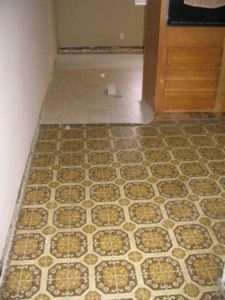 Before you start on that vinyl floor removal project, understand that it’s not like throwing out any household trash. Actually, it’s considered remodeling or construction debris. Meaning, you can’t just put it in the trash bin. So, the local trash collection agency won’t pick it up. This means you’ll have to dispose of it properly. In other words, you’ll have to take it the right place to have it disposed of according to environmental laws. Sure, that’s time consuming and that’s why it’s a good idea to bring in a local junk removal company to take care of it for you. This way, you can also offload a bunch of other unwanted stuff. Pull up a corner. Much like removing carpet from a space, you need to start in a corner. This is where it’s easiest to grab hold of the vinyl to pull up. If one corner is too difficult, just try another. Use pliers or another tool to grab a corner and begin to pull it away from the subfloor. But, do this will caution so you don’t damage the subfloor. Scrape the adhesive off the subfloor. Use a floor scraper to remove the adhesive from the subfloor. Be careful not to gouge into the subfloor or to run the floor scraper into walls or cabinets. Remove any adhesive that does not come up using a scraper with adhesive remover. Follow the manufacturer’s application instructions carefully. Clean and disinfect the entire subfloor. Finish up by cleaning the subfloor and disinfecting it with bleach. Then, allow it to fully dry out and you can install a new floor covering thereafter. When it’s time for vinyl floor or remodeling debris disposal, just phone 800-433-1094 or visit Junk Garbage Removal.